Strip DRM from iTunes Rentals and Purchases (including iTunes Extras). 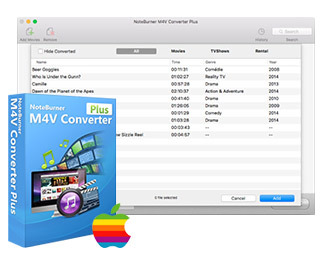 Convert DRM M4V to MP4, MOV, AVI, WMV, MPEG, etc to Play on Any Multimedia Devices. Keep AC3 Dolby 5.1 Audio & All Subtitles/Audios Tracks (audio descriptions). Support Mac OS X 10.8, 10.9, 10.10, 10.11, 10.12. Add the pop-up window to prompt that the program doesn’t support macOS High Sierra 10.13. Fix some conversion failures under iTunes 12.6.1.27. Fix the crash problem under some specific computers. Fix the issue that some Japanese subtitles can’t be converted. Add the pop-up window to prompt to update iTunes when running iTunes 12.6.1.25. Fix the conversion error issue under some specific computers. Fix the program crash and conversion failure issue in some circumstance. Fix the conversion error for batch conversion. Fix the update error issue on Mac10.12.x. Fix the error 1000 issue. Support retaining AD track (audio descriptions). Support more popular output devices such as Apple TV 4, Samsung Galaxy S6, Samsung Galaxy S7, iPhone 6S, iPhone 6S plus, iPhone SE. Fix the problem that the program got stuck while conversion under Mac OS X 10.11 in some circumstance. Modify the profile selection logic and make the global profile apply to all items to be converted. Fix the problem that the most recently used profile does not show in the first place. Fix the black screen problem of the resulting video under Mac OS X 10.11.4. Fix the update error bug on Mac OS X 10.11. Fix the bug that the program can't list TV Show by series on iTunes 12.3.2. Fix the missing progress bar problem in batch conversion under Mac OS X 10.11. Fix the bug that the registration information does not show in registered version under Mac OS X 10.11. Support Mac OS X EI Capitan. Fix the out of sync problem since last update. Support Mac OX 10.11 beta. Support keeping AC3 audio track and subtitles when output to customized MP4/MOV video as well. Fix the display error on history record panel. Fix some AC3 related problems when using Same as source for MP4 as output. Support Mac OS X 10.10. Support the language of Japanese and Deutsch. Fixed bugs about adding and converting files. Optimized parameter settings for Apple devices output. Fixed distorted video problems after converting. Modified the default conversion configuration "Apple TV MPEG4 ". Modified the default conversion configuration "the same as source (mp4)". Gets rid of the support for old Mac OS X 10.4. Fixed crash error to certain systems. Fixed the error of batch conversion. Removed Common Used Video Formats(NTSC, PAL) output formats. Removed the MP4 and MOV input support. Fixed the bug that some users can't load Rentals list. Fixed the conflict error with iTunes when encoding audio.